How do you become the person you want to be? How do you take that image of your life that’s buried deep in your mind – possibly feeling like a long lost dream – and start to bring it into reality? A key ingredient to any “transformation” story involves a moment when the person first began to believe they could become the person they wanted to be. Perhaps it was through a health scare, a personal intervention, or the encouragement of trusted voices – each story is unique but contains this turning point where the status quo becomes unacceptable. You love your work. But it’s burning you out. 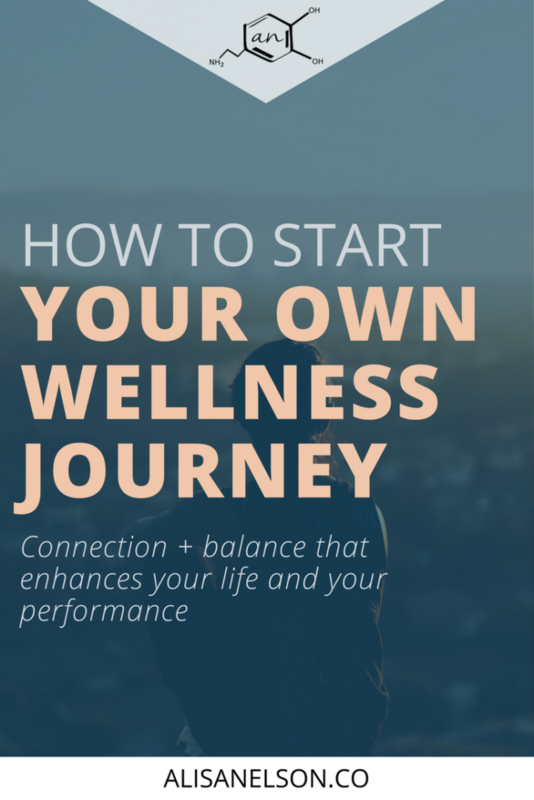 It’s time to find balance + connection to yourself and your mission on your very own wellness journey. How can you encounter that moment for yourself? I want to tell you something: It starts with you. You looking at you. Your needs, desires, and where you are at in both right this minute. It’s tempting to look somewhere else – at your job, your kids, your relationships, your community – and try to arrange them *just so*. It’s harder to assess our own selves. Our behaviors, how we spend our time, the beliefs we hold that keep us from doing for ourselves what we really need to thrive and be truly effective in our work. But I also see you setting too-low of expectations for yourself. Namely, for your level of well-being. Sure, we joke about it all the time in our various spheres — that spread-too-thin feeling that comes just a little bit before the kids are in bed, or in the final weeks before Christmas break. I’ve come across plenty of memes and hilarious tweets giving accurate description to how our energy and passion ebbs and flows throughout the year. With the sad reality being a multitude of people living below their potential while they numb out on social media or Netflix because they can’t figure out how to nudge their lives into a sustainable rhythm of pouring out, taking in, and growth. Don’t let these trends tell you what is normal. Only having enough energy to make it to the closing bell or to the kids’ bedtime is surviving. We want more for ourselves. Build a picture of where you are right now. It’s difficult to go on a journey without a map. And maps require a starting point. In our context we’re talking about a journey to better balance + connection in your life. We want to move beyond burn out into the habits and skills that allow you to continually expand your capacity for pouring out by paying special attention to replenishing your stores. We often hear the word “self-care” thrown out around this time. I should know, I use it myself. But I tend to expand the word beyond taking physical care of your body. A massage or nightly face-mask sounds great but let’s dig deeper. Self-care is anything + everything you need to do to help yourself keep going on your mission. Maybe you can’t rattle off your very own mission statement but we’re talking about that thing you are investing yourself in. Might be your work, might be your kids — whatever it is, seeing your dream come to fruition requires a level of performance you won’t find by accident. In each area of your life you are taking stock of what will move you forward – increasing your own fulfillment as well as you efficacy. This information will help you start to see where your current journey is taking you. That clearer picture is what we need in order to draw a map from now —-> where you want to be. That is how you bring life to your wellness journey. So, what’s the first step to starting a personal wellness journey? We certainly can’t start to tackle every area of your life at once! You may have even tried that already. Research indicates that the best place to start when looking for change is to assess your starting point. Where are you now – what situations currently lead to a sense of fulfillment and what circumstances tend to leave you feeling lost, stuck, or confused? Then, you can start to zero in on these various circumstances and build the understanding + skills necessary to bring about the desired outcome. Remember: We call this a journey because it takes a gradual one-step-in-front-of-the-other approach. The learning of new skills that develop into habits is its own beautiful science because it’s not a one-and-done kind of thing. I’ll close our time together today with questions to get you started building your own self-awareness. The important thing is that you start to get curious about your current self – and that you be honest. You cannot grow if you aren’t willing to take a close look at the input / output of your life. What events or habits (that you currently have) leave you feeling refreshed + ready for action? What events or habits leave you feeling calm or content? What does the transition look like between these actions → getting back to work? What activities have you seen yourself grow in throughout the past few months? Where have you intended to grow but haven’t seen much progress? What behaviors do you tend to fall back on when you feel stressed? Sleeping more? Netflix? Eating out? Spending more time alone? Easily irritated? When you simulate the above behaviors and trace them backwards, what kinds of things tend to trigger them? Asking yourself what’s for dinner? Hearing your kids fight? Looking through Instagram? A difficult day at work? Write down a typical day in your life. You could even do this as the day progresses. How many times do you hit snooze, how often are you picking up your phone to check email/social media, how often are you experiencing those moments of awe + wonder that make our efforts feel worth it (and what situations does it tend to happen in), how do you feel prior to lunch / dinner, what’s your pre-bed routine, etc. What do you think about right before you fall asleep? What are your thoughts as you first wake up? What about at the end of the work day?